Content by Tony Macklin. Originally published on July 17, 2012 @ tonymacklin.net. 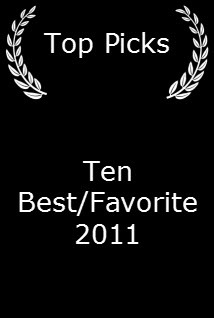 Who says there aren't movies for 60-year old Roman Catholics? Stella Days is making room for a pewful of moviegoers. Stella Days - set in Tipperary, Ireland - in 1956 and 1957, is a quiet look back at a time when electricity was beginning to flicker in rural Ireland, and the light of religion was glaring. Martin Sheen portrays Father Daniel Barry, a progressive priest in rustic Ireland, who yearns to return to Rome, where he once worked in the Vatican library. When a 28-year old Italian was chosen for the position of Head Curator over him, Barry balked, and wound up in a poor district in Tipperary. He is stuck listening to dull, rote confessions - "I took the name of the Lord in vain." His dream of returning to Rome is dashed by the bishop (Tom Hickey), who instructs him to stay where he is and raise money to build a new church. Tim (Trystan Gravelle) is hired as a teacher in the parish school and becomes an ally of the disgruntled Barry. He's from Dublin and loves movies. Barry decides to create a movie theater in order to try to raise money. His adversary Brendan McSweeney (Stephen Rea) thinks many movies are "filth," and he is strengthened in his opposition to Barry when he is elected to local public office. The forces of the future and the past are in severe conflict. Martin Sheen gives a lilting performance as dogged Father Barry. Sheen - a staunch, lifelong, liberal Roman Catholic - continues his professional and personal journey. 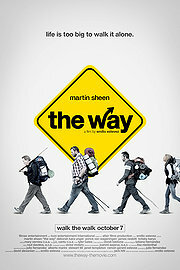 Last year he made a strong spiritual statement in The Way, directed by his son Emilio Estevez. 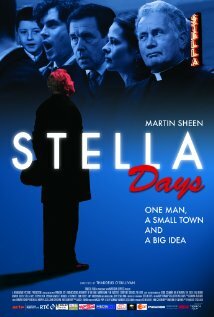 In Stella Days, Sheen again gives a performance emphasizing spiritual and religious struggle. Sheen has become the embodiment of intelligent religion. Father Barry straddles the old and new worlds. He speaks "glorious Latin," and tries to inspire a choir doing Gregorian chants. He also quotes Charlie Chaplin. He's a modern man for all seasons. Stephen Rea has a thankless, one-dimensional role as a regressive religious zealot. Trystan Gravelle, as the teacher, and Marcella Plunkett, as his young landlady are attractive and engaging. Joseph Sullivan plays the landlady's boy, who reminds Barry of himself as a child. Thaddeus O'Sullivan, born in Dublin, directs Stella Days. Stella Days shares the slow pacing of John Huston's adaptation of James Joyce's The Dead. Maybe Ireland slows things down. Antoine O. Flatharta adapts a book by Michael Doorley. There are some pithy lines. The bishop says, "Rome shrinks when you walk into supermarkets in California." Stella Days has several telling references to movies - three directed by Rex Ingram. Also, three movies from Columbia Pictures studio - Cover Girl (1944), It Should Happen to You (1954), and From Here to Eternity (1953) - play a part in Stella Days. The ending may not be as firm as one might want, but Stella Days is a further step in Martin Sheen's spiritual journey.